In a heavy bottom pan add milk sugar evaporated milk and cardamom mix well and let it boil on slow medium flame till it reduces 1/4 in quantity or thick paste like consistency.Rabdi should be in white color not yellowish. Remove it in another bowl and keep in Fridge to chill. In a pan add sugar, water, saffron and boil it .Keep stirring it. Add lemon juice to avoid sugar crystals. Sieve all purpose flour keep it aside. In a big bowl add ghee and 8-10.Cubes of ice beat it with help of hands till ghee become more whiter and fluffy and smooth in texture. Now remove ice, add this ice in water we use later. Add all purpose flour little by little. Add milk first make smooth lump free paste add more flour, milk and repeat this process when milk over we will add chill water until flour finish.Batter of Ghevar should look like pouring consistency. Add 1/4 of ghee in a pan to fry Ghevar. Pour ladle full batter from at least 1 feet height of gas to make holes in center of Ghevar and repeat the process till it settles dow. When it nicely brown in color take it out with help of skewer or stick carefully over a plate. And make rest 5-6 Ghevar. Pour warm sugar syrup over first Ghevar. Spread Chill Rabri over Ghevar. Garnish it with pistachios and almonds slices and silver vark and saffron. 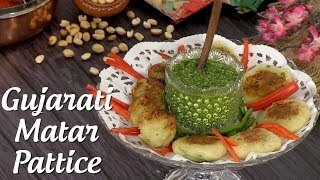 Learn how to cook Gujarati Matar Pattice And Green Chutney by Sangita Bhotica only on #KuchNayaTryKarein. 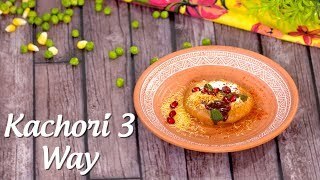 Ghar par banaye teen tarah ki Kachori chef Varun Inamdar ke sath. Watch now #KuchNayaTryKarein. 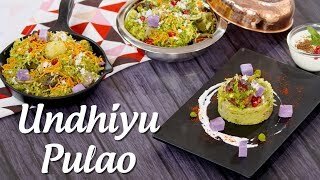 Give a amazing twist to Surti Undhiyu and make delicious Undhiyu Pulao, recipe by chef Varun Inamdar.